The winds of change are blowing through the laptop world at the moment, and this on the back of a fundamental shift in what we perceive laptops to be - from netbooks to ultrabooks, from convertible tablets to the current fad of trying to get Chromebooks to actually work and make them worth buying. Into this melange of competing ideologies we have the release of Haswell, Intel's fourth-generation Core processors refresh. This chip family is looking to redefine Ultrabooks once again. Where does this leave normal laptops, though? Is there still room for a machine that focuses on actually getting a job done? Enter, if you please, the Lenovo IdeaPad Z500 Touch. Lenovo has made something of a name for itself lately by producing affordable, if somewhat mundane, laptops that people actually want to buy - systems such as the Lenovo IdeaPad S405. 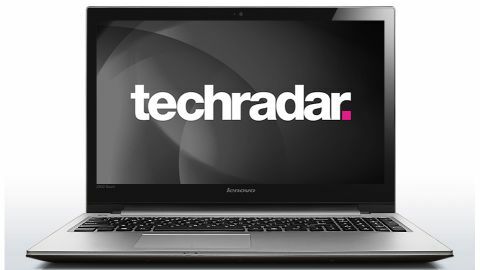 Take a look at any of the recent laptop sales charts and you'll find Lenovo doing very well indeed. In fact the company has just posted record profits, which isn't bad given the state of the global market. This Lenovo IdeaPad Z500 Touch isn't just any old machine though, because as the name suggests, it packs the added kudos of accepting your prodding finger as another form of input, thanks to the inclusion of a touchscreen panel. And because the laptop is rocking Windows 8, this isn't something that is immediately undermined by the operating system... well not totally anyway. That's not all either. The Lenovo IdeaPad Z500 Touch has another ace up its sleeve - discrete graphics. This means that it's vying for market share against the likes of the Gigabyte U2442F as well as more gaming-dedicated machines, such as the PC Specialist Vortex III 680. There is one important differentiating factor when it comes to Lenovo's latest machine though, and that is that the Lenovo IdeaPad Z500 Touch doesn't come with the sort of price tag that you'd normally associate with these kinds of features. Indeed with prices starting at £699.99 / US$899 (around AU$1,165) for the Core i5 model, and this Core i7 model we reviewed only costing £799.99 / US$1,099 (around AU$1,330), we could well be looking at a game changer. Or at least we could if it lives up to the promise laid down by its specification. As first impressions go, the Lenovo IdeaPad Z500 Touch won't exactly set your heart aflame. The combination of a large form factor and a shoulder-straining weight put it at odds with a world that is currently defined by portability. However, there are a number of tricks up this laptop's sleeve that make it far more interesting and versatile a system than you might initially expect. First up, it's worth noting that this isn't an outing for Intel's recently released new processor family, namely Intel fourth-generation core architecture. The Core i7-3632QM may be from the third-generation family, also known as the Ivy Bridge family, but it still packs an impressive punch into its tiny footprint. This quad-core chip has a core frequency of 2.2GHz but has a thermal envelope of just 35W. It's a good chip, despite being last-gen, in other words. The big surprise here though, especially given the IdeaPad's rather sober-looking styling, is the fact that it packs a discrete graphics unit inside its sizeable chassis. This isn't a half-hearted inclusion on Lenovo's part either, with the GeForce GT 740M hailing from the most recent Nvidia family. This GPU has 2GB of DDR3 RAM to call its own, houses 384 unified shaders and has a core operating frequency of 980MHz. Lenovo has paired this graphics core with a 1366 x 768 pixel screen, which you may think is a little coarse given the prominence of 1080p displays these days, but actually for gamers it's a wise move, as we'll see shortly. The vertical viewing angles on this screen aren't brilliant, but it's fine when viewed normally, and the horizontal angles are just fine. And you'll want to get a good viewing angle when you are using this machine, because the other big news on the screen front is the fact that this is a touch-panel display. It is responsive and works really well too. The rest of the specification is fairly straightforward, with a sizeable 1TB 5,400rpm hard drive as standard and the added space offered up by the chassis enabling Lenovo to squeeze an optical drive in there as well. The keyboard is roomy and responsive, although it does feel a little spongy on the right-hand side. The touchpad is sizeable and comfortable to use as well. On the connectivity front you'll find support for wired and wireless networking, three USB ports, a memory card slot alongside VGA and HDMI outputs. In other words, there's pretty much everything you could want from a modern laptop. Despite the modest price tag, the performance offered by the Lenovo IdeaPad Z500 Touch is impressive. The main driving force behind this performance is the Intel Core i7-3632QM processor at the heart of the machine. This may add an extra £100/US$200 to the price of the machine over the base Core i5-3230M version, but in light of the performance garnered from the system, seems like money well spent. Because this is a four-core chip running at 2.2GHz that boasts multi-threading it offers up a total of eight threads - which means it is especially great if the software you're using supports multi-threading. Thankfully more and more software developers are doing just that, so it should help keep this machine at the top of the performance pile moving forward. When it comes to gaming performance, there's a lot to like here as well. Admittedly you won't be playing all of the latest games at the very highest settings, because the GeForce GT 740M doesn't quite have enough silicon to do that, but knock down those settings only a little and you can easily hit smooth frame rates. This is ably highlighted by both Sleeping Dogs and Bioshock Infinite, which are pretty if a little sluggish at the very highest settings, but are transformed by simply dropping down to medium presets. Indeed when it comes to Sleepings Dogs you could easily up the settings a lot more to enjoy better visuals while still maintaining smooth performance. This is a good mainstream graphics subsystem in other words, and well paired to the relatively low-resolution screen. There are a couple of areas that aren't so impressive though, and the first has to be the battery life. Three hours of battery life while playing back HD video may have been acceptable a couple of years ago, but we expect a lot from our machines in these post-Ultrabook times. Not that this machine is particularly portable, weighing in as it does at 2.7kg (5.95lbs). The other area for concern is the drive performance. Admittedly we wouldn't expect to see an SSD included in the specification for this much cash, but that doesn't stop us missing it when it's not there. This is compounded by the fact that Lenovo has used a 5,400rpm hard drive, and by Windows 8's propensity to feel sluggish when you first start using it - it does speed up a little later, but the initial impression is never amazing. Despite our initial impressions, which are bound to throw anyone looking at the machine without knowing who or what it is actually aimed at, a lot of careful thought has gone into piecing the Lenovo IdeaPad Z500 Touch together. It may not make all that much sense on paper, but in practice you'll find yourself seamlessly playing games, tabbing out to prod your way through Windows and then turning the system to more mundane tasks without stopping for breath. That's not to say that it's the perfect machine for everyone, since there are a few annoyances here and there, but it's definitely worth considering if you're in the market for a 15.6-inch laptop and you fancy playing games from time to time. The core specification of this machine is to be commended. The marriage of the Core i7 processor - even if it is a last-generation model - alongside the discrete GeForce GT 740M graphics from Nvidia make for a strong core that should see you through any normal task and game you can think of. The fact that Lenovo has kitted the machine out with 8GB of RAM and a healthy terabyte of storage helps ensure that this machine will last. Add in the versatility afforded by the touchscreen panel, and the overall package is one that we can easily see being used in many different ways throughout the home. Even the optical drive, which is generally an inclusion barely worth mentioning, makes sense here, enabling you to watch DVDs on the bright, vivid non-Full HD screen. There are a few problems with the specification though, and not least of these is the fairly awful battery life. Three hours when playing back 720p videos isn't anything to shout about in this day and age, and neither is the sheer weight of the system. In other words, if you're looking for a machine that you can take with you when you go through the front door, then you should definitely look elsewhere. An SSD would have been a nice inclusion too, even if it was just a small one to act as a cache drive and help offset some of the sluggishness of Windows. Overall, the Lenovo IdeaPad Z500 Touch is an interesting mainstream addition to the market place. Admittedly there are better pure-gaming machines out there, but they tend to cost a good deal more than this, especially if you want real performance. This is a well-thought out system that can play the latest games with a few compromises here and there, and for the money, that's hard to scoff at.